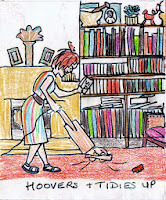 A cartoon blog - strawberry dragons: More stay at home parenting, and some 1920s bon mots. More stay at home parenting, and some 1920s bon mots. I make no apology for showing the world that I worked hard. It is very easy for people to think (admit it!) 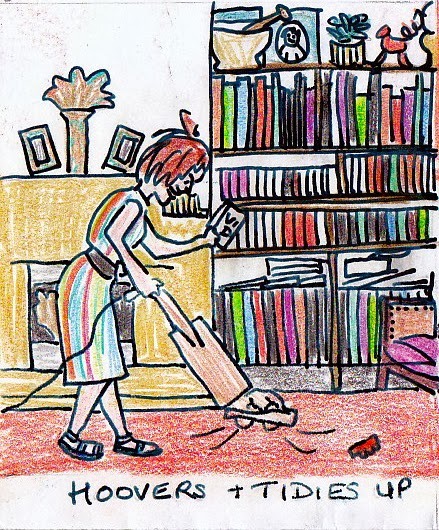 that stay at home Mums do nothing much all day, or that they do a bit of housework and then put their feet up. "What do you find to do all day?" was something I was asked from time to time. This resulted in an answer of varying savagery, depending on how tired, benevolent or hormonal I was feeling. 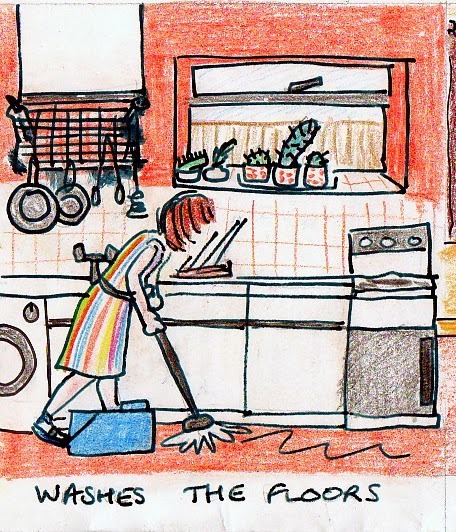 I will be the first to admit that it was fun doing this stuff (although I know not everyone would agree with that), but it is physically tiring doing housework, and if you are doing it properly it is mentally challenging bringing up children. They do not naturally grow up well on their own, they need good solid parenting. They do not always co-operate in this! So there is a sample of a typical day. Other stuff happened as well. George was home from about 12 and had a drink to keep him going while I got his lunch. He was growing so fast and was frantically hungry when he got home from playgroup. 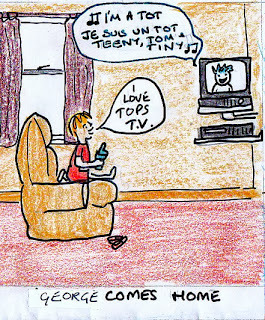 Tots TV was supposed to introduce the child to the idea of French as a separate language. Apart from the theme tune I don't think they remembered anything. They still don't know what a 'sac magie' is any more than the next person, though it featured heavily! A lot of children's TV was very trippy in the 80s, but probably only from a 70s raised adult's point of view. Mind you, look at the Tellytubbies! And nowadays the Night Garden is a bit strange from what I have seen. I always sat with George to eat. He was a messy eater and a wobbly sitter so I was keen to stay close to catch the drips and possibly the child. We used to chatter about what happened at playgroup and who he was best friends with ( everyone). 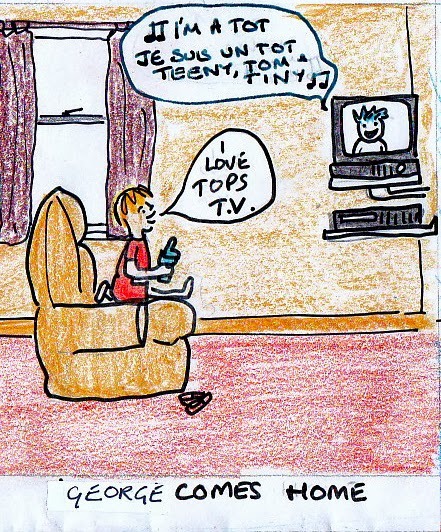 He used to tell me all about Tots TV too, but from what I overheard from the kitchen, it bore no resemblance to what actually happened in the show. The good thing was that it was a lovely programme so I felt he could watch it without being corrupted in any way. 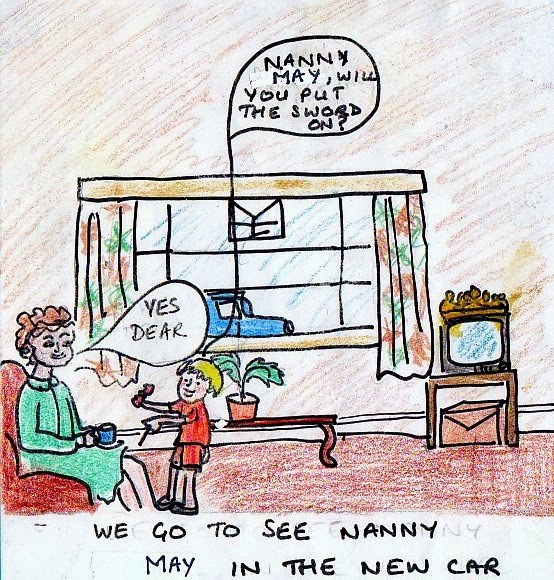 He used to add bits of playgroup games into the story and sometimes talk about the Tots coming round for tea. He lived in a world of pure fantasy, and I wouldn't have had it any other way. A strong imagination is a wonderful gift. My grandmother was still alive and living in her own little flat at this time. We used to go and visit quite often. She was the daughter of an East End mounted policeman. She took lessons as a young girl in the 1920s to improve her speech, as she felt at the time that a London accent did not allow one to 'speak properly' which was really the only acceptable way if you wanted to get on in the world at the time. 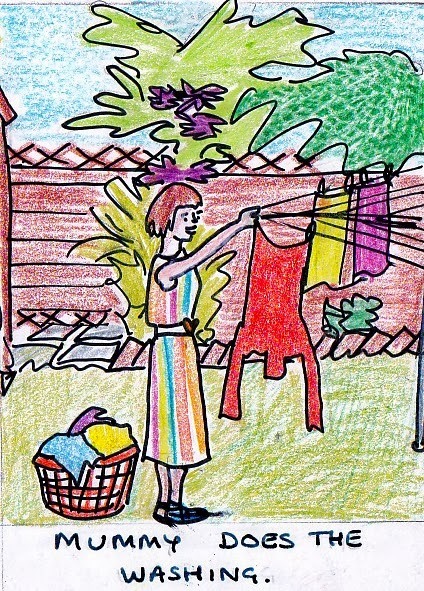 She looked after her mother-in-law for a while. 'Don't say "ain't", Mother', she would chide, say "isn't"'. 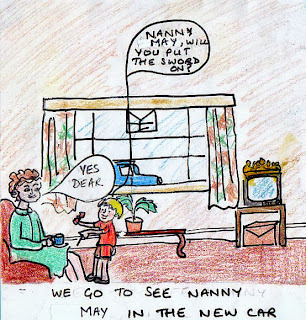 Luckily Great Grandma was very deaf, so never learned where she was going wrong. 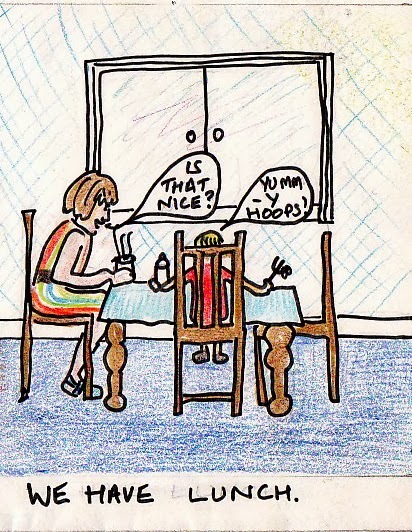 She was a stickler for the correct forms in table manners and speech and just generally. 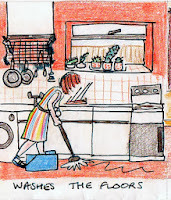 'Cleanliness is next to Godliness' she would say, and mean it. 'Don't put it down, put it away' 'A place for everything, and everything in its place' 'Elbows tucked in and not on the table' and my favourite 'horses sweat, gentlemen perspire and ladies glow'.